BTW after further analyzing the prototype pics it seems that Stringer uses his giant gun like a friggin' electric guitar. Yes. Nice, Stringer is my second favourite hero, the first being Surge. Oh look, it's Leaith. So MOCpages users are here too. I think orange shells actually would look good here- not necessarily better, but just as good as using black. Keep in mind he lower legs use orange bones and there's an orange MTIS on his back, so maybe he's got enough already. I am on MOCpages as Pure Epicness. Oh yeah! 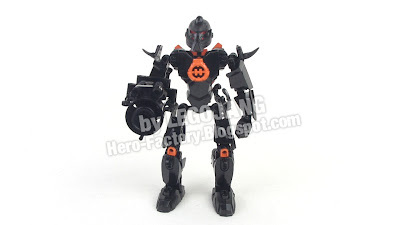 BTW thank you for creating the Vazo, I used the mask name on a MOC (and credited you). They really need to make a mask power for Hydraxon's Kanohi. Hydraxon does not wear a kanohi. Wow, Jang. Just wow. I've seen you do some pretty cool stuff, but the gun is awesome. What makes it so amazing to me is the fact that it is integrated, still having a hand and skeleton pice underneath there. It's just a suggestion, but would if you made animals using the helmets and stuff from 3.0, like a lion or something. Yes MOCPages users are here too. Good job but the Surge revamp was much more aesthetically pleasing. "Bulk is on the way?" Mocpages rules! comment on my stuff now! @Windedge- yeah, it's sort sorta obvious, but usually they just comment anonymously. And I agree, the Surge revamp looked a bit better, but I guess that's probably just because we had a poor finalized set to compare it to. Didn't you know it could also be useg as a guitar? What do you mean? The summer 2012 Stringer has a silver MTIS attached to the bottom of his gin, and it looks like an electric guitar. The 1.0 version didn't have that function. Do you know when Bulk will be posted? Sorry, I'm just really eager to see his supreme and total awesomeness. I built a Breakout Bulk. It had a giant arm that can crush anything! Is the leg design so nessasary anyway. Voltix:A Villain that will be released July 2012. It will be in Breakout. Speeda Demon:A villain that will also be released in July 2012. It will be in Breakout. He has a life you know. He is not an endless MOC making machine. People should know this by now. He has a personal life. You haven't. Can you make a nex breakout moc? What did you use for the chest?